An attempt to rob the PNG Air Office in Alotau MBP this morning by a criminal gang was foiled by police – thanks to quick response by the coppers that saved the airline office and 3 other offices housed by Alotau Supermarket. 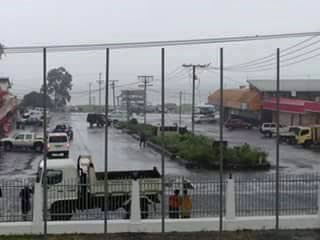 The attempted robbery that happened at around 10am this morning saw officers from PNG Air, and 3 other offices been held hostage for almost 4 hours as police awaited the criminals to exit the building as they barricaded the whole town and the building. After hours of waiting, the police entered the building but found that the criminals had escaped.